January is a good time to capitalize on all that New Year energy floating around and make changes to your life that you’ve been meaning to enact for quite some time but haven’t quite gotten around to. In this spirit, I recently made a beeline to the very bottom of my “long” To Do list and pulled something off of there that’s been chipping away at the outer edges of mind for ages: my website. I’m a writer, you see, so having a reasonably attractive, fully-functional website that succinctly showcases both my background and my current projects is crucial for – well – staying employed. A writer’s website doesn’t have to be anything fancy – and indeed, mine isn’t. (You can check it out here.) But it does need to look grown up and professional and be user-friendly. Which my old one just wasn’t. So this week’s tip list goes out to all writers, near and far, though the lessons should hopefully prove useful to anyone who has a resume that they haven’t looked at in a while. 1. You update your links. Subscribe to just about any blog about freelance writing and one of the first posts you’ll come across is one that reminds you to always, always, always create PDFs of everything you write Online. And that’s because while it’s generally true that things live forever on the internet, plenty of publications will – without warning – decide to yank your URLs and not link to them anymore. While I’m sure there’s some way to retrieve them if you know someone on staff, if you don’t, you’re SOL. When I started building my new website, I was amazed at how many of my links no longer went to the original articles. And that’s just not O.K. if the whole point of having a website is to showcase your writing. As a friend of mine once said about his application to law school, “Given that I pretty much wrote it in crayon, I wasn’t surprised that they didn’t accept me.” My old website was not written in crayon, but it did lack a certain gravitas. And having links that went nowhere was part of the problem. 2. You stop procrastinating. In addition to the relief that flowed after completing this large task that had been bothering me for – oh, about two years – revamping my website also forced me to stop procrastinating on some of the smaller side-projects that flowed from the re-design. To wit: linking to my audio files. I used to work in radio, you see, but for reasons that still elude me, I couldn’t upload all of my audio files to my old website. So I just ignored them, and buried them on my hard drive in places I knew I wouldn’t encounter. But once I confronted the beast and re-did the website, I finally got around to linking to the audio. So now you can listen, for example, to why I *really* embrace such a green lifestyle here in London. 3. You learn new skills. Commensurate with #2, I now know how to update audio files to WordPress.com. O.K., O.K., that’s admittedly not as impressive as blogging in Mandarin or learning to write code, but for the technologically challenged amongst us, I feel like I’ve stepped up my game. 5. You reconceptualize yourself. In a recent post on career change, I made the rather unconventional suggestion that you apply for a job before you’re really ready in order to practice re-imagining yourself doing something new. Updating your website offers a similar benefit. It forces you to provide a narrative of yourself – if not several – that gives you a language for presenting yourself professionally. 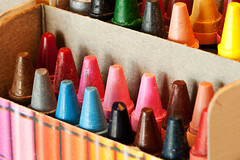 Image: Crayons by GenBug via Flickr under a Creative Commons license. Delia, you say your website isn’t anything fancy, but your impressive credentials speak for themselves! I’m inspired by all you’ve accomplished in academia and journalism. You make good points — sometimes, as in this case, it seems that the process of updating is as important as the finished product. thanks Jackie for your kind words!